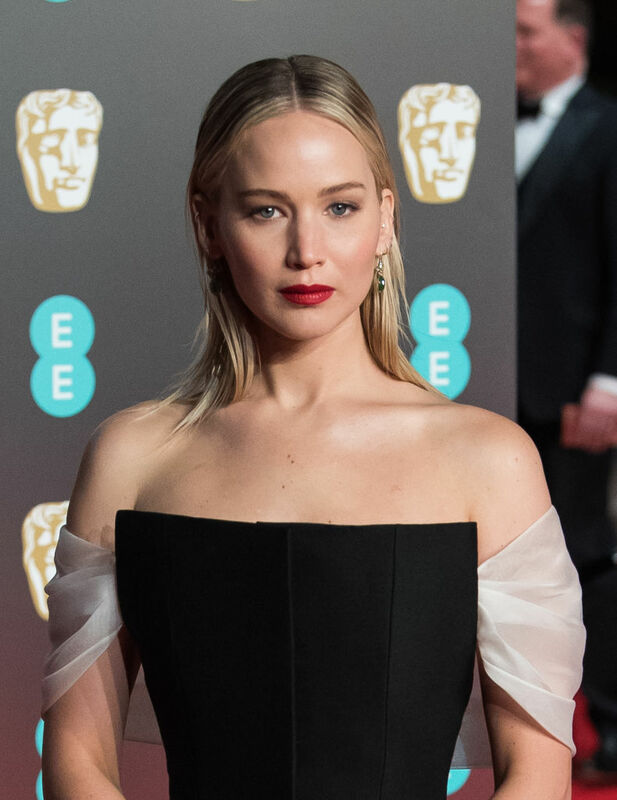 On February 18th, Hollywood stars flew across the pond to attend the British Academy of Film and Television Arts Awards, and one of those stars was Jennifer Lawrence. While she was not nominated for anything this year, the actress presented an award (she’s got Red Sparrow to promote, after all) and we couldn’t help but notice that she switched up her usual glam for the event. When we think of J.Law, we think loose blond waves, bronzer, highlighter, a smoky eye — you know — L.A. girl meets beach chic. But when Lawrence stepped onto the 2018 BAFTAs red carpet, she served up Girl with a Pearl Earring meets Olsen twin vibes. Lawrence rocked a red lip with minimal makeup and parted her hair down the middle with her straight strands pushed behind the ears. This was a very undone look and we almost did a double take. Jennifer, is that you? That type of humor is kind of Lawrence’s “thing,” and while we’re sure it would have played at say, the Golden Globes, the U.K. audience has been tweeting up a storm about how “rude” and “bratty” the comment was. Lawrence explained later that it was an “inside joke” that got blown out of proportion. Apparently, while backstage, Lawrence asked Lumley to introduce her with a ridiculous list of adjectives so that Lawrence could jokingly shoot it down once she got onstage. “I was like, ‘Just [say] adjective after adjective, ‘tall,’ ‘beautiful,’ just say that I’m this and that. And she was like, ‘Alright darling,'” Lawrence later explained to Ronan Keating on Magic Radio (via NME). So her joke didn’t fly. Ah well, at least she slayed her minimal glam while doing so. However, the Cali-girl glam we know and love was back earlier today as she did radio promo around London. Yes, girl, keep on gifting us with multi-faceted beauty. YAS!